Gallo is an Italian company, which dates back to 1927. It’s famous for its bold and bright striped socks – mid-calf and over-the-calf ones. Invisible socks and solid colour socks (mid-calf and OTC) are also available. All Gallo socks are made in Italy on machines with up to 240 needles. They feature hand-linked toes. Gallo socks are made of 100% mercerised cotton (fil d’ecosse); 80% extrafine merino wool + 20% nylon; 44% cotton + 50% silk + 6% polyamide; 79% cotton + 19% polyamide + 2% elastane; 60% wool + 25% cotton + 15% nylon; wool + silk + cashmere; 50% silk + 44% cotton + 6% ployamide; etc. There are a lot of colours and shades available: black, antracite, brown, chocolate brown, burgundy, navy, green, dark green, forest green, beige, blue, light blue, red, orange, etc. Patterns: horizontal stripes (narrow and wide ones), argyle, vertical stripes, polka dots, bird’s eye, fancy patterns, floral patterns. Solid socks are also available. There are several sizes (they will fit UK6 – UK13; woman socks will fit UK2 – UK8). Some socks are offered in ‘one-size-fits-most’. Gallo socks are sold by TheArtofGallo.com (from 14 EUR, incl. VAT), MesChaussettesRouges.com (prices start at 24 EUR, incl. VAT), Sockalia.be (38,5 EUR incl. VAT), Boardroom-Tailoring.com (from 17,5 GBP, incl. VAT). Sometimes you can find Gallo socks on sales (up to 50% off). Gallo socks. 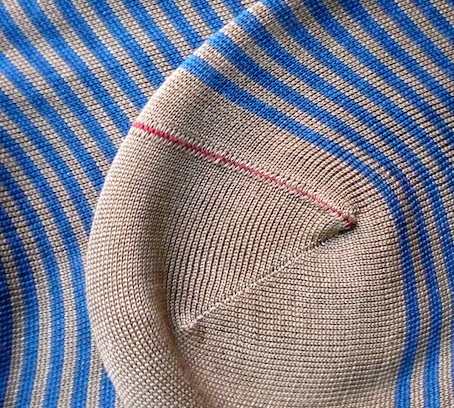 100% mercerised cotton (fil d’ecosse).